Half the school, one spectacle. As half of the student body enters the auditorium for assembly A, there’s a buzz throughout the hallways. The musical preview can be an exciting time for students. It’s a break from classes, and the cast always puts on an exceptional show. The cast gives a warm goodbye in the hallways to the pleased playgoers. Photo by Connor Hughes. As principle Eric Howe attempts to seat the hectic students, I sit back with my camera anxiously. The stage manager, Cheyenne Zuck and assistant stage manager Sarah Zerfoss introduce the cast. They were clearly nervous for the words they had to say. After they left the stage, the orchestra started to play. They played, and played and played. It went from a feeling of anxiousness to a bit awkward quickly. After about five minutes of just music and murmurs from the crowd, I was already thinking something went wrong. But then, the curtains finally opened and out came the cast. Then the stars came on. Matt Noll conducts the train as Cody Goldberg, Tim Deubler, Brian Buckius, Jesse Graham, Joe Gordon, Jared Bonawitz, and Nick Charles ride along and sing a very interesting first scene. It must have taken perfect timing to execute the quick change of pitch from all of the cast members. I take out my camera and snap my first picture, it comes out dark and blurry. I snap another and the flash goes off… everyone within a 20-foot radius turns around with judging eyes. When I realize I can’t hide the fact that it was me who created the giant distraction, I sheepishly say “sorry” and give up on taking pictures for the time being. Hailey Fafel and Jill Wiley in a heart-wrenching scene. Photo by Connor Hughes. When the next scene begins with Tim Deubler taking the stage, all eyes were on him. He grabbed the attention and didn’t let it go until he was completely off the stage. Where did the little kids come from? Elementary schools in Penn Manor apparently. They sure are recruiting young. Although, the kids were in the perfect spot, they were almost prepared as well as the high school students. Miss Teen Pennsylvania, Jill Wiley, did an exceptional job as always with her Disney-quality voice. Penn Manor has been watching her for four years now and she never ceases to amaze. Along with Hailey Fafel, who plays Amaryllis, the aspired pianist who has a crush on someone who is afraid to speak a word to her, the singing was exceptional. Overall the crew did a great job. The choreography lead by Donovan Hoffer was executed perfectly. The plot didn’t draw my attention much, though, and the non-existent cliffhanger at the end didn’t help. Maybe the full version of the play will draw audiences into the story line. 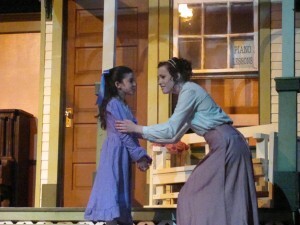 To see the cast in action with the prolonged version of “The Music Man”, the dates are March 4, 5 and 11, 12. Honestly the play was really slow. But that might just be the story, The cast did a fantastic job of acting and singing. I think the author needs to see the full show before he can write a critique. *Editors note: This comment was edited. ITS NOT A PLAY ITS A MUSICAL!!!!!!! No OFFENSE BUT THIS ARTICLES NEEDS RE_DONE! I agree with previous comments. The musical should be seen in entirety before passing any judgment. As a proud member of the pit orchestra, I was pleased with our performance and hope that all will come see the musical! Great job Cast, Pit and Crew! Looking forward to our next two performances! I think that for an adequate review of a production such as this the author should have a broader view of the performance, either background knowledge about the musical storyline or preferably make your review about the full length performance. Knowing the plot line of the story, the parts that were viewed and written about in this article were only the beginning of an exciting story line. The performance is excellent. Also, the music at the beginning is called an overture, that’s how it’s supposed to be, it is designed as a musical lead in to the upcoming performance. I think that to give proper respect to the production staff (i.e: stage manager), the author should take a look at a program booklet to get the names and their proper title. Just wanted to say that Cheyenne Zuck is the stage manager, not the assistant stage manager… and also, who is Sara Zarfus (Sara Spahr maybe?). It’s important to get the names straight! Also, please don’t review the show until you have have seen it in its entirety. *Editors Note: The names are now spelled correctly in the article. The people who are harassing this author are pathetic. This was a great review. The play was slow boring and the opening scene was absolutely terrible. Also the production value was minimal. We could see the pit orchestra from the audience. Tim and Jill stole the show. If they were not there this play would not have even been bearable. Also I’m sure that the names of the stage managers were given to the author either by MT or Ms. Baldridge. This is an article of the AUTHOR’S opinion. And personally I agree with it. And this is a play preview. So shouldn’t this have been the Most enticing part of the play? So he does not need to see the whole play to pass judgment. ^ All completely biast because they are in the musical. Thus, they have views leaning toward the inside not the outside. This show was fantastic. What are you all talking about? I want to come see it again, it was that good. High school theater is high school theater, and for what it’s worth, I left smiling and entertained. Maybe next time a review of a musical is done, the author should actually see the entire show, or even know something about musicals in general. The article is titled “Music Man Review,” which seems to me like it would be a review of the entire show. All of the students involved in the musical have worked insanely hard for the past few months and once again they get no credit for it. Congratulations to everyone involved, the show went wonderfully last weekend and it will be two more great shows this weekend! I feel that to critique a show properly you need to see the production in its entirety. It isn’t right to degrade the efforts of students like that with only seeing the first 4 or 5 scenes! They have put a lot of effort into this production, and compare our funding to other schools. PMP gets barley anything from the school district. We work with what we have to put on the best production that is possible for our money. Review from dictionary.com means: a critical article or report, as in a periodical, on a complete book, play, musical, recital, or the like; critique; evaluation. I understand that a review is the authors opinion; but don’t you think you were a little harsh for only seeing the first 4 or 5 scenes? You might want to consider getting ALL of the facts straight before considering publishing another review. Doesn’t look like he was degrading anyone there. And the funding does not effect the story line or terrible singing by everyone except Tim and Jill. Connor was just clearly saying that the first 4 or 5 scenes didnt pull him in, and left him hanging with a bad cliff hanger, this is an opinion, all that said, good job Tim. Ok, the people giving credit to this article are clearly friends of the author and most of them probably didn’t see the musical. I’d like to see any of them try out for musical and experience how hard it is to learn lines and handle the pressure. Why is there a paragraph about him taking pictures? This is a critique of a musical not a play by play of his life. obviously connor’s friends are going to take his side just like all the musical kids are going to say he did a ‘bad’ review. he said his opinion, he didn’t trash talk at all. let it go. Connor Hughes was just stating simple facts. All you kids in the play, by criticizing your opinion, you’re only showing the lack of confidence you have in how your play was conducted. That is all. No one is stating that Connor Hughes did a bad review, but to the standards of conducting a review, the musical should be seen in entirety before passing judgment. Also, it is evident by the performances this past Friday and Saturday night that the students have complete confidence in their performance. I can’t imagine how difficult it would be for a student to get up in front of his peers and sing about how stubborn Iowans are. I also believe it is sad to see Penn Manor students bashing other Penn Manor students. Shouldn’t fellow students be supportive of the efforts of their peers? Wow. Some of you don’t know how much work is put into this show. To say that Jill and Tim were the only ones who could sing is sooooo wrong… and hurtful. It’s true that they are both very talented, but there is a lot of talent on that stage. Also, to compare Hempfeild’s Cats to our show is unfair. They have tons of funding that is not available to us and the vast majority of Hempfeild kids involved in theatre take regular dance and voice lessons. Just see the rest of the show please as others have been saying before. To only go off the preview is not good because the school preview is usually the worst performance. It is nerve-racking to perform in front of your peers… especially because they are a really bad audience that rarely claps or laughs in response. The review was fine, but what some people are commenting is just flat out mean and completely rude. Connor didn’t even say anything bad about it…he said the crew did a great job. I don’t understand why people are angered by this? I have no problem with this review. I don’t think anything you said was derogatory to anyone who performed in the musical. You are entitled to your opinion about the storyline of the show and no one should take offense to it. I appreciated that you wrote it from your own point of view as an audience member; the bit about your camera was a nice touch. Watch some wording, but overall a good job. Anon and others critizing this review as hurtful or unfare…get used to being critizied about your performance. No matter how good you or anyone else thought you did others will have a different viewpoint. This review is helping you by pointing out things that could be fixed in future plays and never said it was terrible play. Alright guys enough with the drama. This isn’t Jersey Shore. Save the drama for the show this Friday and Saturday night. That’s just my two cents. To Connor: the comments that everyone are posted are much more hurtful than your article. It isn’t a big deal that the preview bored you. Not every review has to be written by someone who loves theater. As far as writing a review, it would have been a better idea to have taken the time to see the whole thing, but that’s really besides the point now that everyone has taken this to the extreme. As a part of the cast i did get annoyed looking through the comments, but looking back, the actual article itself wasn’t offensive. Is this how the pmhs journalism class teaches kids to write?! I thought it would be better, since they won an award. The preview was intended to excite others about the musical and should have been the most attractive part of it to get people to come. Also, just because a lot of work was put into it, doesn’t mean we have to like it. That’s like me putting a lot of work into stealing everyone’s pets and claiming that everyone should like it. dude, this is one of the best reviews ive read in a long time. all those people who destroyed this review shouldnt be. connor didnt do anything wrong, he just wrote a review. by the way, the play was actually pretty good. 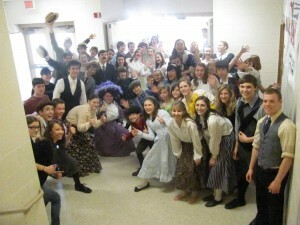 Thank you for reviewing our preview of Music Man. I appreciate your opinion and the time you took to write an article. I hope you were able to later see the full show in its entirety. Also, thank you for the positive support. While the reference to being Miss Pa was thoughtful I would hope that my having been Miss Pa in 2009 would not be the sole reason of how others would view me as a person. It is an accomplishment, but does not define me as a performer and I feel that it has of little use to my involvement with Penn Manor’s Spring Musical. As a member of the community and an avid theatre lover, I think the production was great. The level of professionalism in this musical- casted of HS students with the help of an elementary cast – was exceptional. The show had intricately timed entrances, exits and dance numbers-not to mention a ton of costume changes. I thought having the pit in the gazebo was very creative and the sets were terrific. I chose to see the show more than once and am glad I did. Congratulations to all involved! Cast member: I thought we did a great job. Everyone worked extremely hard over the course of like 2 months. I think we made the show alot more entertaining than the original and cant be compared to cats.